Cargotec's Kalmar reachstackers have proven their worth to leading construction firm Eberhad which recently ordered one more custom-engineered Kalmar DRF450-60S5X reachstacker for its unique waste treatment operations. The company - part of a consortium called ARGE Phoenix - is removing thousands of tonnes of industrial waste near Kölliken, Switzerland. The order was received in the fourth quarter 2009 and delivery of the new unit is scheduled for second quarter 2010. 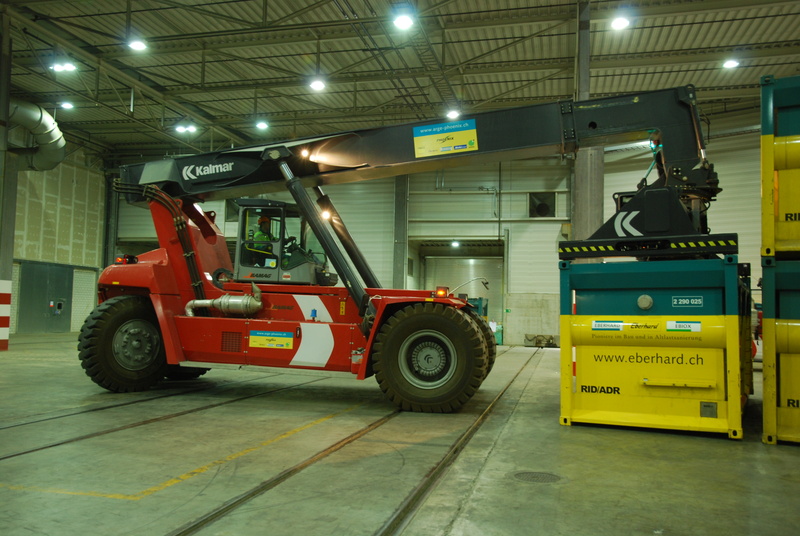 The flexibility of a Kalmar reachstacker fits perfectly with Eberhard's special handling requirements. The customer currently operates with one Kalmar DRF450 reachstacker and one Kalmar DCE100 forklift which have both been optimised to operate inside a waste transfer hall. "Cargotec offers superior technical container handling solutions," says Thomas Angehrn, Equipment Manager at Eberhard. "We have been impressed by the machines' reliability and efficiency even under these unique circumstances. A low speed limit, limited height and effective emissions filters have made it possible to use these machines indoors with exceptional results." Eberhard's newest reachstacker will help expedite the process of clearing the contaminated site of heavy metals and chemical residues threatening a nearby source of groundwater. Cargotec and its official dealer of Kalmar equipment in Switzerland, BAMAG Maschinen AG, worked closely with the customer to design a reachstacker that can tilt 20-foot containers lengthwise at a maximum angle of 55 degrees. The Kalmar reachstacker is a powerful, flexible tool for handling containers. It can handle loaded containers quickly and efficiently in narrow spaces, while still ensuring the driver has optimum visibility. The extensive freedom allowed by the lifting equipment, boom and attachment, and its rotation possibilities, means that the driver can improve the work efficiency of the unit by not needing to approach the container from a 90 degrees position. Instead, the container can be picked or dropped-off by the unit approaching from any angle less than 90 degrees. Since 2006, ARGE Phoenix - a joint venture of Eberbard Bau, Eberhard Recycling, Walo Bertschinger, Richi Weiningen and Ecosoil - has been working to clean up 350,000 tonnes of hazardous waste that was historically deposited in a clay pit near Kölliken. Now a serious threat to the local community's groundwater source, AGRE Phoenix has built an enormous hall where the contaminated soil is analysed and then dispatched to different treatment centres. The Kalmar equipment works inside the hall where the air pressure is kept low so that dust, gas and orders cannot escape. Containers of waste weighing up to 30 tonnes are sealed and loaded by a Kalmar reachstacker onto trucks for transport. The Kalmar forklift handles empty containers in the hall. The consortium expects to remove and treat all of the waste from the site by 2013. Click on the link below to download the photo that accompanies this press release. The photo caption reads: "A DRF450-60S5X handles containers inside a waste transfer hall near Kölliken, Switzerland."